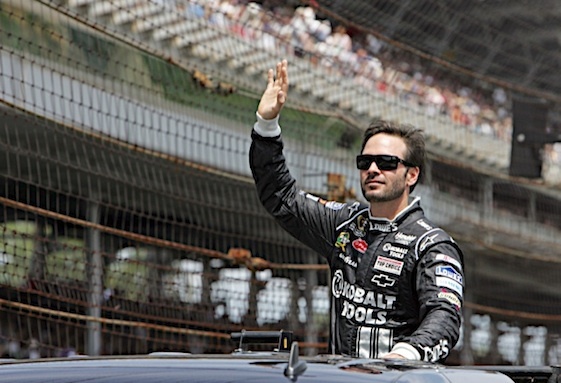 Racin’ Today » Johnson Won At Indy But Did He Win Indianapolis? Johnson Won At Indy But Did He Win Indianapolis? Jimmie Johnson got his fourth Brickyard 400 victory on Sunday and quite a bit has made about him joining A.J. Foyt, Rick Mears, Al Unser Sr., Michael Schumacher and Jeff Gordon as quadruple Indianapolis winners. Of course, all the “elite group” and “exclusive fraternity” descriptions were carted out and all of the “How does it feel?” questions were dutifully asked. And, yes, it is a cool accomplishment for Johnson and the No. 48 Hendrick Motorsports to win four Brickyard 400s and also, debatably, set himself up as the bunch to beat for the championship this year. However, the view here is that the only “elite group” Johnson joined was the really exclusive one which includes just Gordon. But for some – mainly those who love motorsports in general and not just NASCAR or IndyCar or sports cars or the NHRA or Formula 1 – there are only three people who have captured the quad at Indianapolis and those are Foyt, Unser and Mears. Because when you say that somebody won Indianapolis, it is the 500 that you’re talking about. The strong belief here is that winning the Indianapolis 500 puts teams and drivers in a different, much higher category than winning the Brickyard 400, the United State Grand Prix or the MotoGP event at Indy. Winning the 500 is winning Indianapolis. The 500 is so much more than just a big race. It’s a true event. It’s an international event of world significance. It’s 100 years of tradition and history and legends and tragedy. It’s one of the three American sporting events – the The Masters and U.S. Open tennis being the others – which every year causes the rest of the world to briefly stop what it’s doing and at least check out to see who won. When you win the 500, you rule the racing world. When you win the Brickyard, you’ve won one of NASCAR’s top three races. And this is nothing against F1 or stock cars or even the bikes. When the world is reminded that Ayrton Senna won Monaco six times, you can be pretty sure they are not referring to the rally. Not many people would make a point to say there are only two drivers who have won five or more Daytonas – Richard Petty and Hurley Haywood. Johnson and his Hendrick bunch have, denotatively, now won Indianapolis four times. Connotatively, they have not won Indianapolis. Speaking of summer races at Indianapolis Motor Speedway…the thought here is that the Rolex GRAND-AM Series should live on at the place, but that the Nationwide Series race should not. Seeing the sports cars on the infield road course at IMS was a hoot. Rain storms and all. The GRAND-AM people have put together a pretty interesting formula. No, the machinery is not all that exotic, or even pretty, when it comes to the DP cars. They don’t sound very melodic – the Porsches, Ferraris and Audis of the GT class sound much cooler – and the number of cars is shrinking. But they sure do race well. They need a touch more power to get them past the GT cars better, but GRAND-AM always seems to feature close racing and exciting finishes in DP. The GT portions of the races are better still. My gosh, real cars with top drivers racing each other. The Nationwide race at Indy lacked, well, everything. The racing was as non-compelling as in the Cup event but without the sense of major specialness. Probably the biggest argument against racing NNS at Indy is the fact that the series was so good across town at Lucas Oil Raceway Park. The racing was good, the vibe was great. It had become ingrained into the Brickyard weekend; watch the Cup cars work out during the day Saturday at the speedway and then take a sunset ride over to wonderful LORP for some classic Midwestern weekend-evening short track racing. Move NNS back to the cornfields and oil tanks. The guess here is that a lot of my purist-sap peers watched in dismay as yet another racing tradition took a beating from buck-chasing after Sunday’s Brickyard. Kissing the bricks, apparently, has passed from spontaneous act of joy and emotion to kneeling down before gods from whom all wealth flows. It was briefly baffling when a line of purple pillows was laid down across the track near the yard of bricks after the race. Then the purpose soon became apparent; the winners now spend as much time kneeling and kissing the bricks as they do passing over them in their cars. The reason, of course, is so that every sponsor’s hat and gear can be recorded separately during what used to be a charming moment. ESPN analyst Dale Jarrett, who, with his then-crew chief Todd Parrott gave birth to the act after they won the 1996 race, put the scene in perfect perspective Sunday. As some guy was out in front of Jimmie Johnson and his Hendrick team, directing every little detail of the impending tradition-come-photo op, Jarrett softy yet sarcastically remarked how the moment has become a much bigger “production” since the Jarrett-Parrott smooch. Can the day be far off when the kissing of the bricks has a corporate sponsor? : And now folks, it’s time for the Blistex Kiss of the Bricks, brought to you by Revlon and your local Ace Hardware dealer – bringing you the best in paving blocks fine masonry products since 1927. The Western Swing portion of the NHRA season heads to the last of its three events this weekend and it does so with two drivers still with chances for a sweep. Top Fueler Antron Brown and Pro Stocker Allen Johnson stayed in contention for the sweep when they won at Sonoma on Sunday. Brown is a flasy high-profiler who drives for a Don Schumacher Racing team which expects to churn out victories they way it has this year. Johnson is a journeyman lone-wolf kind of guy, using Mopar engines built by his father. Yep, am caught up in the Swing, something that has just spontaneously blossomed over the years. It provides nice, competition-based sidebar action to a 10-month long season. The thought here is that it’s legit; that, yes, the drama of going from prepping cars and racing them at 8,000 feet, to the hot dryness of Sonoma, and then to the unpredictable sub-arctic environment of Kent, Washington is real. It also sets up the Countdown (the need for which is still debatable) nicely. The NHRA also provided the top feud of the week last Sunday. And a confusing feud it was. It involved Pro Stock drivers Greg Anderson and Erica Enders. After Anderson beat Enders in the quarterfinals, the five-time champ said it felt especially good after the disrespect Enders had displayed when she won her first natoinal event by beating Anderson in the final at Route 66 a couple weeks ago. Pressed by wonderful ESPN analyst Gary Gerould, Anderson would not elaborate. Enders seemed baffled as well. She tracked down Anderson and confronted him. Tough to say what was said. Indy is the 500, NA$CAR is Daytona,or used to be Southern 500, NHRA is the Nationals at Indy.